The Intel H77 chipset is the little brother to the beefier Z77 Ivy Bridge chipset, and when we're talking about the P8H77-I we really do mean little. 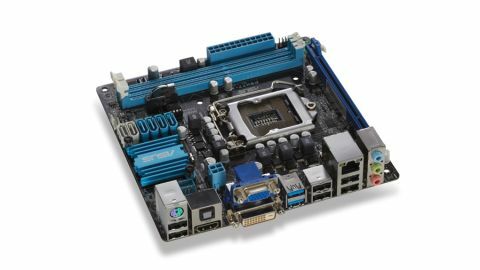 This is another mini-ITX board in the MiniMax range from Asus and that means it's only slightly larger than a CD. As a H77 board it's also not going to be as feature-rich as the more advanced Z77 chipset, and there are also a few artificial restrictions put in place by Intel itself for general marketing/categorisation reasons. The main restriction, as far as us obsessive tweakers are concerned, is the lack of any real overclocking allowed by this more mainstream chipset. That's a shame, but not really a surprise. Given the cheaper price of the board, and subsequently the components used in making them, a H77 board generally wouldn't have the power design to cope with the rigours of chip-stressing. That doesn't necessarily mean the H77 chipset, in particular on this here Asus P8H77-I board, is a bad choice for a cheaper gaming system. With the Z77 chipset, and all the potential that holds, the temptation is always to pick up a K-series CPU for the OC fun, whether or not we need that power. Stick a decent, non-K i5 Ivy Bridge chip in this board and pair it up with a discrete GPU and you'll have the heart of a decent little gaming machine. It also gives you more in the way of chassis options - you won't need to spend a lot to pick a case with plenty of clearance above the processor for a beefy cooler. Put this together inside something like Cooler Master's Elite 120 Advanced with a low profile chip chiller and you can happily fit a standard PSU and graphics card in there to make good with the gaming frame rates. The P8H77-I has got a full-length PCIe 3.0 x16 slot, so you're not going to be missing out on a lot of GPU power running through this board. As expected, the performance of this H77 board is off the pace compared with the Z77 crowd, but it's certainly still capable of holding its own. And if you're not looking for the highest scores in Cinebench you're unlikely to be disappointed. It also comes with all the SATA 6Gbps and USB 3.0 goodness, though as a small-form factor board it has fewer ports than its full-size brethren. The actual board layout has been nicely designed too, not keeping a whole heap of hot components sat on top of each other despite the limited board space. While we're not going to be giving this P8H77-I any sort of top performance awards you can't argue with the £66 price tag, especially considering the sort of micro gaming PC you could put together using this wee slab of silicon. Asus has given us a couple of great mini-PC options here with both its Z77 and H77 offerings, meaning that if you want to take a punt on small-form factor gaming it needn't cost a fortune or require a serious performance compromise on your behalf.